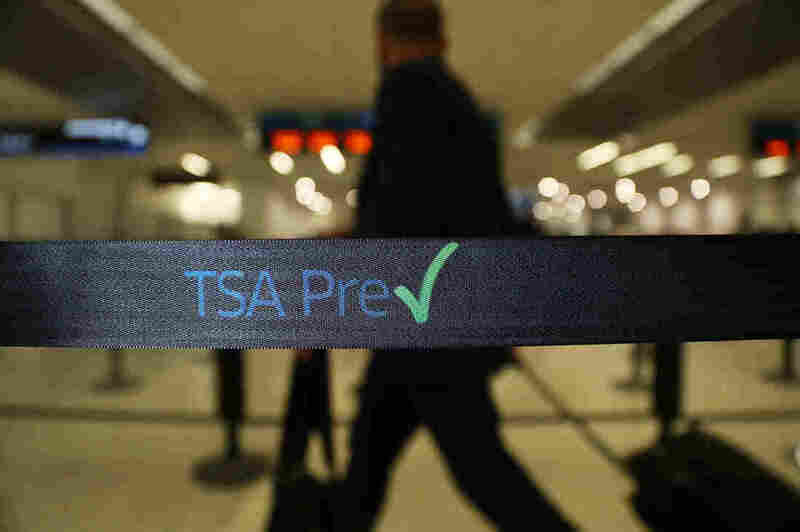 TSA PreCheck Applications Soar Amid Long Lines At Airports They don't take off their shoes, they don't take out their laptops and their numbers are growing every day. Some 16,000 people per day are applying for the government's airport pre-screening program. Travelers go through the TSA PreCheck security point at Miami International Airport on June 2. The number of TSA PreCheck applicants has more than doubled owing to record security wait times. Navigating airport security lines is a hassle, for most. Among the exceptions: passengers with TSA PreCheck stamped on their boarding pass. They don't take off their shoes, they don't take out their laptops and they often clear security in just a few minutes. And now, there are a lot more of them. In the past three months the number of applications for TSA PreCheck has more than doubled. Almost 16,000 people a day are now applying for PreCheck. That's a huge increase from less than 7,000 a day in March. This jump in applications is likely prompted by longer-than-usual wait times at some security checkpoints across the country. MorphoTrust, the company TSA contracts with to process all PreCheck applications, is scrambling to keep up with the demand. "We are in a emergency response mode here at MorphoTrust," says Charlie Carroll, a senior vice president at the company. He oversees the 300-plus PreCheck enrollment centers across the country, which have been swamped in the past few weeks. There are a few other programs that offer access to PreCheck security, such as Global Entry — which also allows expedited processing through U.S. Customs and Border Protection. It is seeing a similar bump in popularity. But as far as the traditional TSA PreCheck, enrollment stands at just under 3 million. That's a far cry from where it's supposed to be. When the program launched in 2013, former Secretary of Homeland Security Janet Napolitano had lofty ambitions for the program. "Our goal is to get to half of passengers having some kind of PreCheck capability within the next two years," she said. Because initial enrollment was so slow, TSA made an effort to boost the numbers. It was called Managed Inclusion 2 and it meant that anyone could be randomly assigned PreCheck on their boarding pass. "I used to get the PreCheck automatically," says Elaine Young, a consultant from Washington, D.C., who was just about to enter the security line at Reagan National Airport. "And it was really great when it worked and it worked all the time where we were able to speed right through." But last fall Young's luck ran out. TSA discontinued that procedure after an individual known to be a security threat was assigned PreCheck in Minnesota. So now, travelers who want the perk have no choice but to pay up — $85 for PreCheck valid for five years. TSA has a new goal now: 25 million enrolled in PreCheck by 2019. That could very well happen if applications continue to soar. Just down the hall from the security checkpoint at Reagan National Airport is a different kind of line. In a small office next to baggage claim there's a packed waiting room, with some people standing, luggage at their feet. It's one of those 300 PreCheck enrollment centers run by MorphoTrust. Applicants with appointments are seen quickly after they arrive but walk-ins are forced to wait over an hour, at least. These enrollment centers exist because part of the PreCheck process requires an in-person interview. Applicants are asked a few questions: height, weight, any felonies? And then applicants are fingerprinted. That's really what sets PreCheck fliers apart from everyone else. Applicants are vetted through FBI databases and if authorities determine their record is clean, they're approved. After paying the fee, applicants hear back in about two weeks. "I think it's ridiculous; it's obscene. Americans shouldn't be charged for that," says Rep. John Mica, R-Fla. He's on the House Oversight Committee and believes the security process should be streamlined. "They're spending all of their resources shaking down 99 percent of the people who pose no risk," Mica says. He complains that TSA is extremely inefficient; he wants to see all airport security privatized. Airlines haven't been happy either. They were counting on having more people enrolled in PreCheck because it eases airport security lines. Also, PreCheck travelers give significantly higher ratings for their flights than passengers who stand in longer lines. Not surprising. A quick search on Twitter shows hundreds of fliers praising the program. "#TSAPreCheck is nothing short of lifechanging!" tweeted Charon Darris, a consultant in Oakland. A slight exaggeration, he admits. "I mean it's not literally life changing. No one was gonna die if I didn't get through faster but it was amazing," Darris says. "I was running a little bit short on time and got through probably in about three minutes," he says. Darris was just recently approved for PreCheck. Last week was his first time in the fast lane. He says he wouldn't dream of going back. Ironically, the more airport security wait times increase the more PreCheck is in demand. And in that way, TSA stands as both the cause and the solution to a problem that has been steadily getting worse.